Need4search.com is the PUP that uses misleading techniques to prevent removal. Use Reimage to locate malicious components and get rid of them faster than with uninstall instructions. A full system scan blocks virus reappearance and prevents traffic to malicious domains. What is known about Need4search.com virus? How does this suspicious application spread? What should you do in order to remove Need4search.com? Need4search.com virus is a suspicious computer program, which is admitted to be a browser hijacker. It means that it is a potentially unwanted program (PUP), which can initiate various unpleasant activities on victim’s computer. Once it gets into the system, it finds and locates all Internet browsers and adjusts their settings to set a different search engine, homepage, as well as new tab page on them. Once the victim attempts to access one of the Internet browsers, the indicated website immediately shows up. It has Trovi sign above the search box and promises to deliver Bing search results. However, such search engine should not be trusted as most likely its search results are going to be modified, filled with sponsored content, and meant to catch user’s attention. Computer security experts advise to avoid using this search engine due to the redirects that it causes, which might lead you to shady or even harmful Internet websites. Trovi.com is closely related to this site, and both of these search engines have been developed by ClientConnect, Ltd. It seems that this company is a mother of numerous browser hijackers and potentially unwanted programs that have no beneficial features but are meant to serve third-party ads and drive traffic to specific Internet sites with an intention to generate pay-per-click revenue. It is not advisable to click on Need4search.com search results because you can never know what third-party site you might be forced to visit afterward. Such site can be secure, but it can also be very dangerous. To avoid potential risks, spyware researchers recommend you to remove Need4search.com using Reimage software and use another web search engine instead. Need4search.com removal can be carried out manually, too, so if you do not want to delete this virus automatically, scroll down to see manual removal guidelines. Need4search.com potentially unwanted application installs browser extensions upon its arrival to control user’s browsers. But have you ever thought how can you avoid installing such suspicious computer system additions? In fact, that is rather an easy thing to do. You just need to take programs that you install on your computer seriously, even if they seem completely harmless. No matter if you want to install a game, file format converter, media player, or a similar program – make sure you install it in the correct manner. That means you cannot install it anyhow and in a rush. We strongly recommend you to choose Advanced or Custom settings for the installation, and then see if your downloaded program contains any additional files that you might not want to obtain. If after selecting these settings the setup wizard expands and shows at least a few proposals to make changes on your computer system, deselect these. Usually, these additional programs, browser add-ons, and similar content is nothing but spyware or even malware threats that can do no good to your computer system. If you are not an experienced computer user, you might find Need4search.com removal a difficult thing to do. If so, you might want to opt for automatic removal option. In case you do not wish to hunt down components of Need4search.com virus manually, install a valid and reliable anti-malware solution and then run a system scan with it. However, if you think that you can handle this problem by yourself, just read instructions given below and remove Need4search.com redirect virus manually. 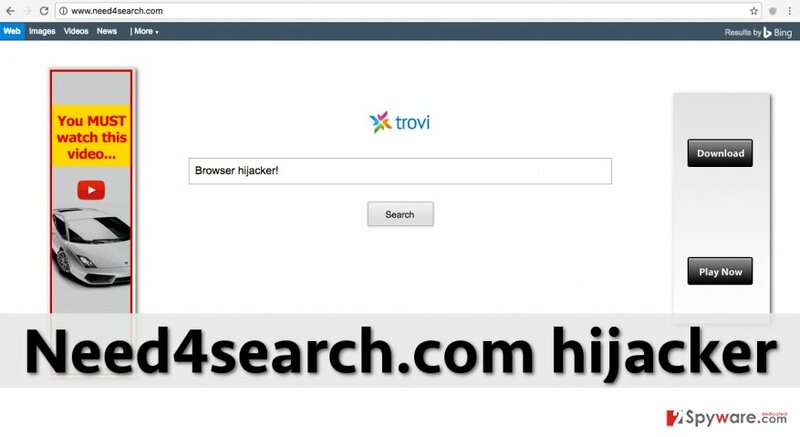 Do not let Need4search.com hijack affect the quality of your browsing sessions, and if for some reason you cannot delete this browser hijacker using these instructions, please send a question to our support team then. Here, look for Need4search.com or any other recently installed suspicious programs. Wait until you see Applications folder and look for Need4search.com or any other suspicious programs on it. Now right click on every of such entries and select Move to Trash. When in the new window, check Delete personal settings and select Reset again to complete Need4search.com removal. Once these steps are finished, Need4search.com should be removed from your Microsoft Edge browser. Here, select Need4search.com and other questionable plugins. Click Remove to delete these entries. Now you will see Reset Firefox to its default state message with Reset Firefox button. Click this button for several times and complete Need4search.com removal. Here, select Need4search.com and other malicious plugins and select trash icon to delete these entries. Click Reset to confirm this action and complete Need4search.com removal. Here, select Extensions and look for Need4search.com or other suspicious entries. Click on the Uninstall button to get rid each of them. Here, look at the Homepage field. If it was altered by Need4search.com, remove unwanted link and enter the one that you want to use for your searches. Remember to include the "http://" before typing in the address of the page. Now you will see a detailed dialog window filled with reset options. All of those options are usually checked, but you can specify which of them you want to reset. Click the Reset button to complete Need4search.com removal process. This entry was posted on 2016-08-16 at 06:14 and is filed under Stealing programs, Viruses. You can quickly scan the QR code with your mobile device and have Need4search.com virus manual removal instructions right in your pocket. How did you remove Need4search.com virus?